In my Diary dated January 15, 2016, I had said that I expect the government to increase the excise duty on petrol and diesel soon. On that very evening, the central bureau of excise and customs, which comes under the ministry of finance led by Arun Jaitley, increased the excise duty on both petrol as well as diesel. This after the price of the Indian basket of crude oil had fallen to $26.43 per barrel on January 14, 2016. This is the eight increase in excise duty on customs and excise since November 2014. The first increase had happened on November 12, 2014. With the latest increase the excise duty on petrol stands at Rs 8.48 per litre. Between November 2014 and now, the excise duty on unbranded petrol has gone up by Rs 7.28 per litre or a whopping 607%. With the latest increase the excise duty on unbranded diesel stands at Rs 9.83 per litre. Between November 2014 and now, the excise duty on unbranded diesel has gone up by Rs 8.37 per litre or a whopping 573%. The landslide victory of 2014 handed Modi more than just a clear mandate...It handed him immense responsibility of a nation dreaming of great progress. Who will answer the question how Modi can turn this ship around and get India back on track? 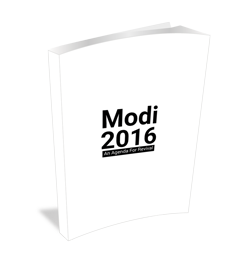 Vivek Kaul has the answer and he has put it all down, along with his deepest thoughts on the challenges India faces, in our latest special report titled - Modi 2016 - An Agenda For Revival. And the best part is that he wants to give you this special report for free! The government has clearly captured in a large chunk of the gain because of lower oil prices. As on January 16, 2016, the price of petrol in Mumbai stood at Rs 66.09 per litre. In November 2014, when the excise duty was raised for the first time, the price of petrol in Mumbai had stood at Rs 71.91 per litre. Hence, for the end consumer, the price of petrol in the city has fallen by 8.1%. As on January 16, 2016, the price of diesel in Mumbai stood at Rs 51.25 per litre. In November 2014, the price of diesel in Mumbai was at Rs 61.04 per litre. Hence, for the end consumer, the price of diesel in the city has fallen by 16%. How much has oil fallen by during the same period? As on November 11, 2014 (a day before the excise duty on petrol and diesel was raised by the Narendra Modi government for the first time), the price of the Indian basket of crude oil was at $79.11 per barrel. By January 14, the price had fallen to $26.43 per barrel or close to 67%. In rupee terms the price of oil has fallen by close to 64%. But the price of petrol and diesel has fallen by only 8.1% and 16%. In fact, if we look at the price of oil in rupee terms, we can come to a very interesting conclusion. As on January 14, 2016, the price of the Indian basket of crude oil was at Rs 1,773.19 per barrel. One oil barrel is basically 159 litres. This means that one litre of the Indian basket of crude oil costs around Rs 11.2 per litre. One litre of bottled water (or what we call Bisleri at the generic level) typically costs Rs 20 per litre. Given this, bottled water in India is now nearly twice as expensive as oil. Or to put it in another way, oil is now half the price of that of bottled water, but only for the government. You and me have missed out on this party. Of course, these gains haven't been passed on to the end consumer and have been captured by the government. Interestingly, petrol prices since February 2015, have actually gone up. The price of petrol in Mumbai as on February 4, 2015, was at Rs 63.9 per litre, whereas currently it is at Rs 66.09 per litre. The price of the Indian basket of crude oil was at $54.97 per barrel on February 4, 2015. It has since then fallen by more than 50% to $26.43 per barrel. One of the points that typically gets made in favour of the government increasing excise duty on petrol and diesel is that these fuels pollute and need to be taxed in order to protect the environment. Data from Centre for Monitoring Indian Economy(CMIE) points out that between January and December 2014 a total of 18,385 thousand tonnes of petrol was consumed in the country. Between January and December 2015, a total of 21,089 thousand tonnes of petrol was consumed within the country. This was around 14.7% more. A major portion of this would have come from an increase in new vehicles which run on petrol. If one takes this into account, then the consumption of petrol during the last one year, has not gone up significantly, and this despite lower prices. How do things stand with diesel? Between January and December 2014, the total amount of diesel consumed in the country stood at 69,022 thousand tonnes. Between January and December 2015, the total amount of diesel consumed in the country stood at 72,652 thousand tonnes or 5.3% more than the previous year. Again, if we adjust for newer diesel vehicles and other ways in which diesel is used, the total amount of diesel consumed in the country didn't go up significantly, despite lower prices. What this tells us is that the increase in consumption of petrol and diesel has happened because of new vehicles and not because of lower prices. So does this mean that the government will now clamp down on the production of new vehicles or increase taxes on them to make them more expensive for people to buy them and in the process control pollution? Also, if the government was serious about pollution, why has the price differential between petrol and diesel gone up in the last 15 months? In November 2014, the difference between the price of petrol and diesel was at Rs 10.87 per litre. Now the difference stands at Rs 14.84 per litre. This raises the question that why is the government incentivising diesel, which pollutes more? Further, the bigger question that no one in government seems to be ready to answer is what happens when oil prices start to go up again? Given that the government hasn't passed on the bulk of the fall in price of oil to the end consumer, it is only fair that it does not pass on an increase in prices as well, as and when it happens. In that scenario where will the government get the money for to continue to finance its expenditure? This is something that Arun Jaitley, who I call the excise duty hike minister these days, needs to answer. Or will the government increase the price of petrol and diesel, something the Bhartiya Janata Party (BJP) had majorly protested against when it was in the opposition. Postscript: In order to understand why the government is increasing the excise duty on petrol and diesel, read this: Happy new year folks: The govt has increased excise duty on petrol and diesel again! Equitymaster requests your view! Post a comment on "Oil is Now Half the Price of Bottled Water in India, but Only for Govt". Click here! 8 Responses to "Oil is Now Half the Price of Bottled Water in India, but Only for Govt"
I wonder, where are all these huge money, earned by Government with the lower oil price, is going? Firstly may I convey my appreciation for your many well researched articles which have often helped me understand developments eg in the real estate space , and the Yuan. 1. It is perhaps better not to allow petrol and diesel prices to fall in line with crude as this will only encourage greater consumption of a commodity which is largely imported and whose use is polluting. 2. Oil reserves are diminishing, and prices are bound to rise sooner or later. Hence policies which result in limiting consumption will help contain imports and hence balance of payments, fiscal deficit etc in the days ahead. Dear Mr. Kaul, your article is interesting but does not give full information. You say the price of retail Petrol has come down by 8% from Rs. 72 to Rs. 66 when oil price has come down by 64% and the reason is govt has captured all the benefits by increasing excise duty from 1.20 to 8.48. But even if there was no increase in excise, the retail price would have come down to Rs. 59, which is still only 18% less as against 64% fall in oil prices. Clearly there are other components of the retail price which have also increased substantially, may be State Taxes or Oil Company Margins. Hence please give us the full beakup of all the components of retail Petrol price before and after the excise duty increase, i.e, between 72 and 66. The writer has not though how government was managing when oil was quoted above 100 dollar. Oil which is mostly consumed by rich people for their driving expenditure where in some family more than one car is also available for riding.It is better the writer can keep watch on how govt is utilizing accumulated money, whether it is used for productive and essential purpose. It was indeed an interesting topic, explained by you. Since you are having such data, I would question you to calculate, what if Govt. have not raised the excise duty and pass it on to the consumer. What I want to say is that crude oil have come down from $79.11 per barrel to $26 per barrel, if everything was pass on to consumer than what would be the price to consumer. Because when the price starting to roll back, Govt. would be having only Rs. 8/9 per litre in term of excess Excise duty. I think there is some cushion which oil companies must also having with them too. Else govt. would be deep trouble if price roll back to $79.11 per barrel and Petrol price increase to Rs. 100 / litre. Please see from this prospective too. Vivek Kaul's articles are lacking depth in analysis & truth. Statistics can be presented the way you want. Ex. Whopping 587% to explain 9 Rs hike as joke. World oil price is 12 yrs low, does it mean that you will get that price OR there are contracts signed in the past are valid & to be honored? Is it like your wife going to evening street side market & bargaining with street peddler for 500 gms of Tomatoes? How can fill up that billions of loot by likes of Deora & Moily. Do you think people believe your stuff. Go and smell the coffee. The price of crude petroleum seems to have fallen from about Rs 33 per litre to about Rs 11 per litre or by about Rs 22 per litre. The Govt seems to have captured Rs 8-9 per litre of this saving. Where have the remaining Rs 13-14 gone? Will you please throw some light?